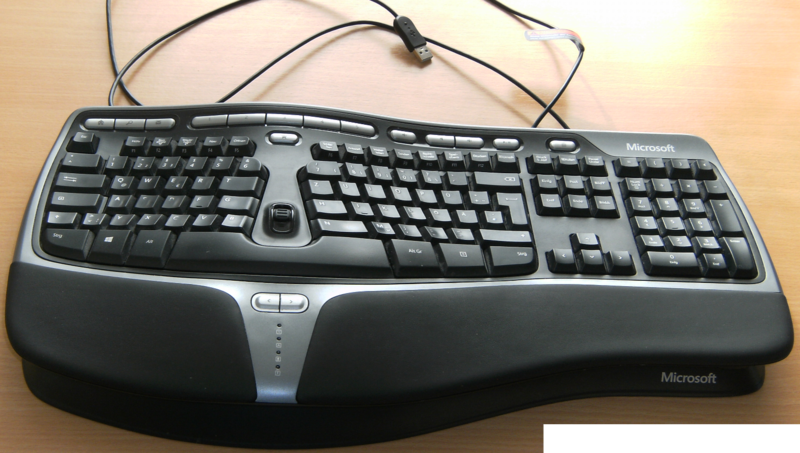 This is the second part of my article about ergonomic keyboards and keyboard layouts. In the first part I wrote about different characteristics of keyboards, touch-typing, typical injuries of people typing frequently and my first experience with an ergonomic keyboard: A curved keyboard from Microsoft. Probably too late (I already suffered from pain in my hands) I decided to get one of Microsoft’s “Natural Ergonomic 4000” keyboards. It’s quite a bit more expensive than the average keyboard but I hoped that it was worth the money. The initial impression was at least ambiguous – or probably even negative. I could see the idea behind the ergonomic design and wanted to believe that its wavy style was superior to the simpler curved one. But the whole thing is a true beast of a keyboard! It’s very big. No, actually it is huge – and not only in length but also in height. The later is a problem if you (like me) have a sliding board under your desk where you put the keyboard. Chances are that it won’t fit there. And then, for a personal view, it is really ugly. It wasn’t easy to develop a friendly attitude towards that thing. The first day I used it, I had to switch to my old keyboard again to enter my boot passphrase. I’m the kind of guy who cannot remember his passwords but knows pretty well which keys he presses. And so it was nearly impossible for me to enter a long password at first because the keyboard felt very different from anything I had ever typed on before. Another thing is the split design; I used to type the ‘b’ key with my right hand for example. This was no longer feasible with the new keyboard thanks to the gab. This was a major nuisance until I realized that it was not the keyboard getting in my way but in fact a bad habit of mine. From this perspective the new keyboard even helped me to get rid of that bad habit and I’m quite happy with that fact now. As I was getting used to it this became less and less of a problem (the same is true for the passwords). It took me about two weeks to adopt the new style enough to type without pressing the wrong key too often. After a bit more than a month things started to feel alright again. My typing speed however was reduced for many months and I felt that I never actually reached my best times again. But the reason for that was not the keyboard. It was myself choosing to learn a new layout. While the US keyboard layout can be found around the world when it comes to servers, it simply does not qualify for most languages. This is perfectly clear for the Russian Cyrillic alphabet, the Greek one or the Asian languages. But also most European languages which use the Latin alphabet as well, have additional characters which English does not have. This is why there are so many national keyboard layouts. However the additional characters come at a price: Some other characters are moved and may even require a combination of keys. The German keyboard is a fine example of a very bad keyboard layout today. It features the umlauts (Ä,Ö,Ü) and other characters, but some special characters are not very convenient to reach. In the days of typewriters it may have been ok because you would not need characters like the backslash, curly braces and so on. These examples are located in hard to reach places with AltGr+Plus sign, AltGr+7 and AltGr+0. The problem is that you need them a lot on the computer. Just think how often you need the curly braces if you’re a programmer… You see the trouble. A lot of programmers in Germany actually just use the US keymap for work. I can work with US pretty well, too, but this is not the ultimate solution. Fortunately there are the so-called alternative layouts. In the English world Dvorak is the best known one. It has the same characters as the default US keyboard but another layout. A lot of people claim that they can type faster with this layout. The idea here is that the letters which are most often used in English are placed on the home row (this is the “start position” where touch-typists have their fingers when they start typing). This sounds like a good idea but critics claim that there’s barely an improvement in speed it at all. I’ve never used Dvorak so I cannot say much about it. There’s also a less well-known alternative for the English keyboard that is a more modern variant: The Colemak layout. If you are mostly typing English text you may really want to try it out. It’s meant as an even bigger improvement over Dvorak – and it adds a lot of characters from other European languages! Whether you need a Spanish Ñ, Scandinavic Å or Turkish Ç – no problem. While I’ve never used it myself I must say that it sounds pretty good. And then there’s the most advanced layout that I know of: NEO². It’s a modern re-organisation of the German keyboard that considers letter frequency of both German and English. It uses several dead keys (keys which do not produce a character themselves but modify the next key pressed adding an accent or something to a letter) and has six (!) layers. Thanks to that it can create special characters like the whole Greek alphabet (in lower and upper case) and dozens of special symbols. Thanks to that unique flexibility you can use it for pretty much any language which uses Latin letters! The letters are the following: Every normal key press is layer 1. Shift+key press is for layer 2. Caps lock+key produces a layer 3 symbol. And so on. Isn’t it great to finally have a good use for that nice big key below tab? Another cool thing is that this layout is already shipping with X11. So in the Unix world it is always just one “setxkbmap de neo -option” away! I admit that I knew about alternative layouts for years but I never cared to take a look. When I finally did, I decided to give NEO² a try. It was self-evident that it would not be easy to fight two decades of QWERTZ writing. And yes, I was in for a fair share of pain. I had to learn a new keyboard completely from scratch. Damn, where was that letter again? I decided to practice a few minutes every day and after some time I found the right letters after thinking a few seconds. My WPM (words per minute) literally dropped to < 10! As a (previously) fast typist this was a very distressing experience and I can see why quite some people quit instead of really finishing the migration. It takes a lot of resolve and endurance. But hey, there's no free lunch! I decided to stick with it and kept getting better and better. One day I found that I could reach 20 WPM again, then 30. You can imagine my relief when I hit 50 again. Now I could type fluently type texts with NEO². After taking a one more week to learn the most important special characters and feeling bold one day I decided to switch my layout at work. The password problem was back again and for some weeks I switched layouts back and forth when I had to enter passwords. But it was only a matter of time until this was no longer necessary. I've been writing NEO² for quite a while now and I'm still failing to hit 70 WPM on random text. Since I quit practicing after reaching 50 this is pretty much ok, I think. Was it worth the trouble to switch over to a new layout? You bet it was! Learning NEO² was one of the best decisions I've made in the computer field next to abandoning the Windows platform. I can only recommend it to everybody who is interested in this kind of thing. Invest some time – it really pays off. The next post will finally feature my review of the TEK (Truly Ergonomic Keyboard).